The Grimké sisters were born in South Carolina and knew the evils of slavery first hand. They left the South, settled in Philadelphia, became Quakers, and worked with abolitionist leader William Lloyd Garrison in the campaign against slavery. Angelina Grimké wrote an Appeal to the Christian Women of the South in 1836, urging southern women to help persuade their men to end slavery. Soon after, Sarah Grimké wrote An Epistle to the Clergy of the Southern States. 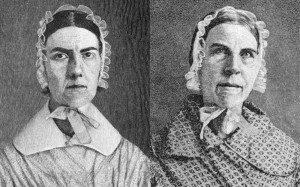 The sisters lectured nationwide and attempted to unite the cause of women’s rights with the struggle against slavery.